Lately I’ve been swatching like a crazy person. Crocheting peacefully in my favorite spot is a great antidote for all the snow days we have had the past month. I am attempting to get lots of new proposals created, as well as working out more designs for some self-publishing projects. Unfortunately, I can’t really show you what I’ve been working on. It’s the super secret aspect of this designing journey. So strange, I’ve got loads of crochet stuff happening, but rarely can share about that on my blog…which is supposed to be primarily about crochet design. I can share with all my lovely readers about my latest new designs that are in the June 2013 issue of Crochet World. 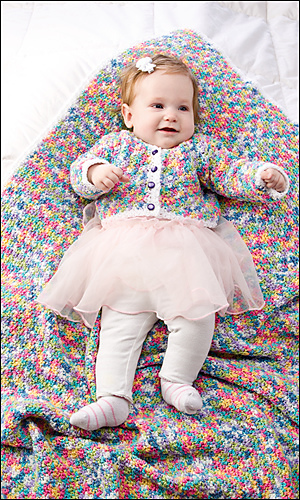 The Butterfly Days Baby Set, which is a snuggly blanket and cardigan for your favorite little one. This is an easy stitch pattern worked with a lively yarn to create a very cushiony but breathable fabric to keep the chill of air-conditioning off baby. And the Sea & Sand Necklace, a fun simple-to-make beaded crochet project that will look great with summer necklines. I designed this using Paton’s Silk Bamboo blend thread. I like silk and silk blends for jewelry as it is a very strong fiber and tends to hold up better to wear. Plus there is the gleam of the fiber and the way it holds color. This issue of Crochet World is available in electronic version already and will be on newsstands very soon. Oh wow. I am going to have to make myself that necklace. I’ve made a scarf in the Paton’s Silk Bamboo and it is nice stuff. Off to buy the e-version of the magazine!